Subscribe to comments with RSS or TrackBack to 'Minor League Rotations: Good and Bad Starts'. Whelp, McGowin is looking quite as good any more, although I liked him in his call up last year. but Fore’s Joan Adon had an encouraging start, which is good to see. AAA: Adams has only given up one hit and one walk (!!!) in five innings while striking out 11. In short, he’s been awesome. If he’s truly figured things out this time, he should be on Half Street by the end of the month. Voth is the only Fresno starter who has done much to write home about. McGowin has been up and down. AA: Crowe is the story here. I had some concern that he had hit his ceiling last year, but he’s definitely taking a step forward and is looking like a legit MLB prospect. Fedde actually struggled in his first start, but the no hitter made his overall stats look a lot better. A Harrisburg commenter on Nats Prospects claims that Sharp’s stats got blown up by a double that should have been called foul that led to a four-run inning. I’m more intrigued by Braymer, a power lefty rising in an organization with few decent portsiders. Condra-Bogan has been strong in the ‘pen. Still not sure whether to start believing that Barrett can make it all the way back. A+: Slim pickings, across the whole roster, not just the arms. Tetreault is a touted guy who is making strides. Reyes got bombed again yesterday and is fully in career-reverse. In the ‘pen, keep an eye on Fuentes, who has 13 Ks in 7 IP. A: Fletcher and Teel sure look like they should be starting over some of the guys who actually are. I’ve been high on Fletcher all along, a Friday starter for a quality program at U of H. Good to see Cate off to a good start after post-draft struggles last summer. Stoeckinger is another touted lefty who struggled last year but looks better now. Istler: ??????? I thought he would be in big-league camp. I’m pretty sure that Fore said he saw him WPB, so he does still exist. Some of the other returns from last summer salary dumps are off to good starts, though: Harrison, Lara, and Condra-Bogan. This team is going to be bad until Soto gets going. He is key to the whole lineup and he’s been pretty bad so far. Impatient, jumpy, pull happy. They’re screwing with his mind with the soft stuff. He has to adjust. 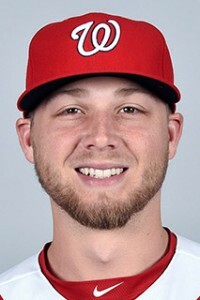 We need to get him and Rendon going at the same time to be formidable. I feared Dozier would be an Uggla and those fears are coming true. I think Rizzo and company take pride in the fact they’ve never had to admit to the really albatross contracts. They always play the money in key spots in the lineup no matter how bad they’re playing. Has hurt them in the past with Werth, and slumping Zimms and Harpers. Just play Howie everyday, admit the Dozier mistake, sit Zimm against righties and ditch the cute pitcher #8 trick. And hope Turner is effective when he gets back. And just pray for the bullpen. I don’t know how Williams went 11 scoreless in spring training. His stuff looked small yesterday. I’d take his spot in the pen and just rotate anything from the minors there with plus stuff that might be a lottery ticket for a few weeks. Just keep throwing Rosenthal out there and hope something clicks. That wild 100 mph at least frazzles the nerves of the opposing hitters. Yep, not liking the body language of this club at all. They got the two big wins in Philly but then came home and fell apart. They were supposed to make hay against PIT and SF but currently 1-3 and not managing to score more than three runs a contest. It’s far far too early to give up on Dozier and “admit a mistake” (although it’s impossible to disagree that he’s been terrible because he’s been terrible). You must resist the urge to overreact to 15 games. There’s a strong case, however, to start Howie more. I’d be comfortable with a 50/50 split, or even a 60/40 split in favor of Howie. Dozier needs to get regular ABs, though, because Howie has value as a 4th OF. The situation at 1B is different. Adams should start against righteys at least 2/3 of the time even when Zim is going good (which he is not, right now; he had two dreadful MAT-esque Ks on breaking pitches last night). And if this is what a Soto slump looks like, then that’s okay. The concern is that this is closer to normal. Again, it’s just 15 games, so far too early to draw conclusions. I think you absolutely admit a mistake give up on Dozier in the 2 hole. he’s not #2 hitter by any measure last year, this spring, and now. let him bat #8 if he’s lucky enough to get above .200 and hit a few meaningless home runs. Bat looks slow… eyes looks slow. I have said a few times in recent weeks that I thought Dozier was one of the wild cards for this team. If he were to regain his 30+ HR stroke, it would be a significant boost for this club. I haven’t given up on him, either, but right now, it’s hard to argue that Kendrick isn’t the better option. As for Soto, no one seems to want to discuss it, but it strikes me that a big part of his “problem” is that the guy behind him in the order is slashing .188/.298/.271. It doesn’t take Joe Maddon to realize that you don’t give Magic Juan anything to hit at a time when Zim is so tied in knots. Soto is desperate to make something happen and is expanding his strike zone at times. (At other times, the ump last night expanded it for him, which doesn’t help.) Maybe Soto needs to move up ahead of Rendon, or perhaps try Robles in the #5 hole. No, it’s not panic time, but it is time to try some different things and perhaps give some guys a little more pine time than they’re used to. There are too many good teams in the NL East to be bowing to sacred cows and not trying to hurt any feelings. Just FWIW, I looked at NatsTalk and they’re discussing this all over the place today. It’s hard to ignore, though. SOMETHING has to be done about the Zim and Dozier problems. I agree that Dozier shouldn’t be hitting #2, but, as you point out, the reasons for that are (1) his performance over the last year-plus, not his performance so far in 2019, and (2) there are other, better hitters on the team who should hit above him in the lineup – again, because of lengthier information about track record. Still, I’m not going to get all that agitated about the batting order. Who plays is FAR FAR FAR more important than the batting order. I don’t think anyone in the Nats org thinks Dozier is a sacred cow. If his poor performance continues, we’ll absolutely see more of Howie. I suspect there’s some concern about playing Howie too much coming off injury. It’s hard to evaluate that from the outside. Still, we need more Howie in the lineup. Zim, on the other hand, is a sacred cow and should be starting less against righeys, full stop. I am not confident we’ll see that change made unless there is an injury. But really, the single biggest error that KW and I keep harping on is the failure to address the gaping hole in the lineup that is Wilmer Difo. There’s absolutely no reason to expect him to hit, and there’s a good hitting middle infielder in AAA who we reasonably expect ought to be able to hit substantially better. Maybe Kieboom can’t stick at SS long term. For a team that won divisions with Ian Desmond playing SS – the same Ian Desmond who has played exactly 14 innings at SS over the last 3+ seasons since he’s been out of the organization – it can absorb sub-optimal SS defense for six weeks if it means Wilmer Difo doesn’t get 4-5 ABs every night for those same six weeks. I agree a tick up in defense is never worth a horrid bat. See Espinosa, Danny. Last night Difo shortened his swing and soft stroked a couple past the infield. If you are going to play him, I would make that approach an order or cut him. if Difo ever hits another shallow fly ball it’s one too many. I’ve talked about slumps and Zimm is so obvious to see when he’s on one of his extended down cycles. I’d play him one or twice a week most until it’s obvious he is seeing the ball better. Soto, we have to stop making excuses about protection for him and others as is often done. Some of the games best hitters like Freeman etc, never have all star protection. Just realize the situation and stop swinging at garbage. Soto needs to concentrate on left field hitting for a stretch. i guess it’s hard to do when you’re pressing. There are actually fewer sacred cows on this team than there have been in a long time, but Zim is the holiest of the holy. I don’t think he’s done — and when he’s hot, he’s still capable of coming close to carrying the team — but when he’s cold, he’s still never learned how to still contribute (something Soto already seems to understand). So go to a straight platoon at 1B and then reconsider if/when Zim gets hot against LHP. But we all know this isn’t going to happen. The resistance on bringing up Kieboom is mind-blowing. There’s no logical reason/argument against it. I’m tired of jumping up and down about it. Soto will be fine. He’s one of the least of my worries. But what could it hurt to give him a few games with Rendon behind him? 1. Eaton-RF; 2. Kendrick-2B; 3. Soto-LF; 4. Rendon-3B; 5. Adams-1B; 6. Robles-CF; 7. Kieboom-SS; 8. Gomes/Suzuki. If Zimm and Rendon are your team leaders, that’s big trouble. Slow heartbeat guys. That may be what TalkNats referring to on recent article re Rendon. Stats are different than leadership and clutch. Rendon seems to be different now in a good way without the glare of Harper hype whitewashing the team. He is off to the rare hot start for him. He would have made a few all star teams if he ever started like he finished. But Zimm is such an excuse maker. He seems very at ease with his cold streaks thinking the hot ones make up for it. He seems very at ease with the struggles of baseball in general. But I think the cold streaks outweigh hot streaks. Especially in the heart of the lineup. That approach has made Zimm a lot of money, but Charles Howell III is very successful too but not like a tournament winner. Baseball has had a way for years with hiding bad hitters at the bottom of the lineup so they don’t kill rallies by the better hitters. Hits need to come in bunches. We have a lot of pressure relief valves for opposing pitchers. Howie Kendrick. Matt Adams. Any questions? Dozier and Zim will both have roles to play as the season progresses. But at this time and place, Kendrick and Adams provided a big boost at a key time. I’ve really been pulling for Austen Williams, but it’s clear that he’s not ready for prime time. Time for Austin Adams to get his turn. Back to minor-league pitching, another solid start yesterday by the guy at the top of this page. Not sure what the pecking order is right now for additional MLB starters, but he guess would be 6. Ross; 7. Fedde; 8. Voth. Another perfect inning from Austin Adams yesterday as well. While I agree about Kieboom, it pales in comparison to the bullpen issues. Look, I’ve been trying to stay open minded about this, but I’m afraid I’ve reached the end of the line. Martinez is a problem and I think they should fire him. He has no ability to manage a pitching staff. Admittedly he hasn’t been helped by the bullpen construction, and I don’t know if he picked his own staff or Rizzo did, but they certainly aren’t providing him any help. But the guy is going to kill the few pitchers who can be effective, from starters to relievers. I expect Doolittle’s days as an elite reliever are over, for instance. He’s now starting to blame the players openly, which is never good. He has to go. I’d bring up Knorr rather than one of the retreads on the major league staff but at this point, anyone will do. I greatly respect Mike Rizzo, but what is with him and managers and bullpens. He is as bad at those things as he is good at everything else.